For many years, His Holiness Sri Ganapati Sachchidananda Swamiji has given Healing and Meditation concerts with steady growing success in India and in western countries. Playing and singing His own compositions, He is accompanied by excellent musicians on classical Indian instruments. This chosen Ragas – supported by the manifold sounds of his synthesiser – are highly able to harmonise the body and the mind of the listener and many reports are known about healings by listening to Sri Swamiji’s music. But Sri Swamiji’s activities go far beyond the musical sphere. In India, He is revered as a great Yogi and Saint and has held numerous inspiring Yoga classes all over the world. In His Ashrama in Mysore, south India, He is known for cultivating the old Vedic traditions and His social activities are many. Charitable trusts, founded by Sri Swamiji are also supported by the music productions. “Nada Himalaya” is a unique experiment in which the music, unrestrained by rhythm flows like the Ganges from atop the Himalayan Peaks. Sometimes it dances down the steep slopes, colliding against the hard rocks on its course and forming sublime sprays of ascetic ecstasy, while at other times, it takes off like an eagle, determined to surpass and conquer the mighty peaks. 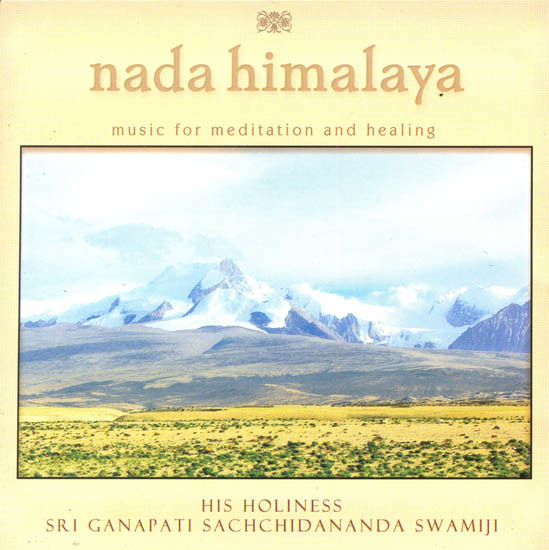 Therefore this album has been aptly named “Nada Himalaya”. It soothes and reassures the fatigued nervous system and infuses divine tranquillity. It is therefore a common experience for a listener to slip into blissful sleep. Sri Swamiji advocates that this album be enjoyed during nights, before resting. Towards the end, there are powerful Sanskrit Hymns – addressed to the resplendent forms of Lord Dattatreya – to enable the seeker to involve the divine consciousness into his inner self. This is the ultimate means for achieving everlasting peace. A peaceful heart is the harbinger of a peaceful world.